TARGET.com Gets In A Ton Of Harder To Find 2012 Product! Some very hard to find figures have showed up in stock at TARGET.com! Click through to see if you can score any of them! Special thanks to JTA reader Corey for this list with links! It's hard to believe something that is accessory sized is considered the "figure" and the "figure" in the accessory, but that's exactly what happened with Infant Luke Skywalker With Obi-Wan Kenobi. Learn more in our Research Droids Reviews database today. Feel free to leave your own thoughts in our comments section, vote in the poll or even leave comments about it on our Facebook page. Click the banner below for the direct link to the review! As always, you can also send your own personal review requests via email if you'd like to see something that we didn't cover yet. Sideshow Collectibles gives fans another 12 Days of Sideshow Star Wars announcement: Yoda (Jedi Master) sixth scale figure, as featured in Revenge of the Sith! The big question coming from this tease is standing behind our favorite Jedi Master: Is that a sixth scale Kashyyyk Trooper standing next to Commander Gree? Click through for the tease! It's hard to believe something that is accessory sized is considered the "figure" and the "figure" is the accessory, but that's exactly what happened with Infant Leia Organa With Bail Organa. Learn more in our Research Droids Reviews database today. Feel free to leave your own thoughts in our comments section, vote in the poll or even leave comments about it on our Facebook page. Click the banner below for the direct link to the review! As always, you can also send your own personal review requests via email if you'd like to see something that we didn't cover yet. A New Year Means A New Category For Reviews! We have a few neat things planned for our readers on New Year's Day as we celebrate an all new exciting year of Star Wars, but we wanted to give you a little tease now to build some anticipation. New 2013 product will begin being reviewed on the first of January. In preparation for this, we have already established the new category: Star Wars [Attack Of The Clones/Revenge Of The Sith 3D]. It will be abbreviated as SW [AOTC/ROTS 3D] in our RDRs! This Is No Fish Tale! You probably won't believe this tale of The Vintage Collection Millennium Falcon, but click through to read what JTA reader Frank experience with his online order! JTA moderator Paul B. finally let's us know that his local Walmart is also marking down remaining Discover The Force and general TPM 3D product as well!! Click through to see what you may find on clearance at your local store. Paul B. lives in Ohio. JTA moderator Paul B. also sends in word that his local Walmart has reduced remaining Black Friday 8-packs down 50% off to $12.50 each. This brings the figures down to less than $1.57 each! INSANE! Click through to see this craziness! The Vintage Collection Wave 12 Continues To Arrive At TARGET! JTA moderator Paul B. sends in proof that wave 12 is STILL hitting TARGET. These were just found today! Click through to see his score! Our Walmart spy has kindly sent us in the latest module for Walmart (their 2013 reset). While not too much is revealing or earth-shattering, it does appear that Walmart DID get the memo that The Vintage Collection has been "continued" for early 2013. Click through to see what you should expect at your local Walmart store in the near future. The Bossk Mini Bust is a brilliant interpretation of the character. We discuss if from head to torso in the Research Droids Reviews database today. Feel free to leave your own thoughts in our comments section, vote in the poll or even leave comments about it on our Facebook page. Click the banner below for the direct link to the review! As always, you can also send your own personal review requests via email if you'd like to see something that we didn't cover yet. You can still get free US Domestic shipping on orders over $50! Valid thru Dec 31st 2012 at Dorkside Toys! *Terms apply. Stock of the of the last wave of the Vintage collection is reducing as people realise when it's gone...it's gone! Lumat, Weequay, Prune face, Ahsoka, Royal Guard and more are still in stock.... Lots of Clone Wars classics, 'Greatest hits' & older vintage collection in store too. Click through for more! JTA reader Derek H. eagerly shares how he spiffed up his wife's Christmas Village for Christmas! Check it out! Our good friend Justin Cook from Yakface.com has just posted a new chapter in his excellent Rykrof Enloe photonovel series. There's a lot of great custom work here and a well thought out plot. Don't miss it! Click through for the latest arc of the story! When you see an image like this, you really have to ask what was Hasbro and Lucasfilm, Ltd. thinking to produce this much product for 2012. Walmarts are swimming in them still and now you can get them for half price at Five Below! What a disaster! Special thanks to JTA moderator Sjefke for the report! Sideshow Collectibles continues their 12 Days of Sideshow with day 4 and another Star Wars announcement. Click through for the Darth Vader Mythos teaser, and keep an eye on the 12 Days of Sideshow calendar for more updates! Let's hope they work some quality 1:6 scale announcements in in the coming days! Our friends at Yakface.com have the very first report of the MTT on clearance at Walmart for 50% off. Check out their report! The Zuckuss Mini Bust is a brilliant interpretation of the character. We discuss if from head to torso in the Research Droids Reviews database today. Feel free to leave your own thoughts in our comments section, vote in the poll or even leave comments about it on our Facebook page. Click the banner below for the direct link to the review! As always, you can also send your own personal review requests via email if you'd like to see something that we didn't cover yet. Shrinkage: So Much More Than A Seinfeld Episode! Fix Your Clones! Wow! Haters of the phase II helmet making your TVC clones look ridiculously out of scale to them (I am talking to YOU Justin! ), check out what JTA reader Josh M. has done to "remedy" the problem! Who would have "thunk" it to "shrunk" it? Looks like our friends at Yakface.com have uncovered some photos of a few upcoming LEGO sets, including a new (smaller scale) Sail Barge. Click through to check it out! Here is a quick update from Big Bad Toy Store about some new preorders and cool new arrivals. We are going to be looking at a 1:6 Scale Figure from Sideshow Collectibles today in our Research Droids Reviews today! It’s Leia Organa (Imperial Senator: Alderaan) which is a decent representation of her! Feel free to leave your own thoughts in our comments section, vote in the poll or even leave comments about it on our Facebook page. Click the banner below for the direct link to the review! As always, you can also send your own personal review requests via email if you'd like to see something that we didn't cover yet. It's time for December's action-figure packed edition of the Curto Burns Collectors Cast featuring all the latest news from a Galaxy Far, Far Away. We catch up with all four authors of Star Wars: The Ultimate Action Figure Collection - Steve Sansweet, Anne Neumann, Paul Harrison and of course our very own Dan Curto. As promised last month, Kyle Newman is back to review the last wave of The Vintage Collection, discuss the latest news from Hasbro and finally pick out the winner for our signed Ben Quadinaros figure. Happy Holidays! Darth Maul Returns Drops Again! FYI – Darth Maul Returns has dropped again in price at some TARGET stores for a low $9.98. Special thanks to JTA moderator Sjefke for the head's up! Sideshow Collectibles has kicked off their 12 Days of Sideshow, and today's update officially announces (with a tease) the Premium Format Snowtrooper. Click through to check out the teaser poster, and keep checking the 12 Days of Sideshow calendar for more updates! We've got one more TVC vehicle to add to our Research Droids Reviews database today and then we're done (until the new 2013 releases)! See the packaging details to the Rebel Armored Snowspeeder. Feel free to leave your own thoughts in our comments section, vote in the poll or even leave comments about it on our Facebook page. Click the banner below for the direct link to the review! As always, you can also send your own personal review requests via email if you'd like to see something that we didn't cover yet. Another big Merry Christmas from the team at JTA! Today's festive Visual Guide update features the Celebration VI Exclusive Commander Ganch, decked out in his 25th Gift-giving Battalion outfit... well, maybe not, but they sure are some seasonal colors he's sporting! Last years Holiday Yoda would be proud to have him by his side. Click below to check out this very cool (and colorful) Expanded Universe figure from Sideshow Collectibles! How many of you remember waking up Christmas day as young and eager Star Wars fans and finding a Millennium Falcon under your tree? This year Hasbro has allowed that experience to be relived "literally" thanks to the rerelease of the Millennium Falcon in The Vintage Collection packaging! See this gorgeous box and ridiculous MSRP in our Research Droids Reviews today! Merry Christmas! Feel free to leave your own thoughts in our comments section, vote in the poll or even leave comments about it on our Facebook page. Click the banner below for the direct link to the review! As always, you can also send your own personal review requests via email if you'd like to see something that we didn't cover yet. Merry Christmas and happy holidays to all of our wonderful readers. Your support of our site this year means more than you could possibly imagine. We encourage you to please remember the true heart of Christmas and take a moment to reflect on some of the non-material things you have too. Thank you. 2013 Class I Sets In Stock At ToysRUs.com! ToysRUs.com has the 2013 Class I vehicles in stock as of this posting. Special thanks to Dan at StarWarsCollector.com for the information! The encouraging news here is that they're $23.99, a bit better than the astronomical $27.99 in NYC and Hartford CT that we reported our readers were finding. 'Twas the night before Christmas! Happy holidays to all of our readers! Here is a small token gift from JTA to you: a different review than we typically do, the AT-AT (All Terrain Armored Transport) but only focusing on its packaging. We took close ups of the box to capture all of the detail for you. See it in our Research Droids Reviews today! Feel free to leave your own thoughts in our comments section, vote in the poll or even leave comments about it on our Facebook page. Click the banner below for the direct link to the review! As always, you can also send your own personal review requests via email if you'd like to see something that we didn't cover yet. On December 8, 2012, JTA broke the news that the "online only" wave 16 of The Vintage Collection was found at FYE. Click through for the original story. It all changed when Gentle Giant Ltd. released their General Grievous Mini Bust. They had to find a new method to bring his unique body shape into this format. See how they did it in our Research Droids Reviews today! Feel free to leave your own thoughts in our comments section, vote in the poll or even leave comments about it on our Facebook page. Click the banner below for the direct link to the review! As always, you can also send your own personal review requests via email if you'd like to see something that we didn't cover yet. We were all so "concerned" about doomsday that we missed an important announcement! The circle of the Disney/Lucasfilm Ltd. merger is now complete. Click through for all the details from the PRESS RELEASE! Dorkside Toys writes in with a great update! We are one of the few online retailers with some stock left of the last wave of The Vintage Collection. An often overlooked figure in the wave, AOTC Obi-Wan is an absolutley stunning figure and only $8.99! Plus Lumat, Weequay, Prune face, and and more are in stock.... 'Greatest hits' older vintage collection classics are around too. Top up the holes in your collection before you miss out. Also, you can still get free US Domestic shipping on orders over $50! Valid thru Dec 31st 2012. *Terms apply. Click through for more! Some New 2013 LEGO Sets Hit Kmart! JTA reader Zeeg R. writes in to let us know he's found some 2013 LEGO sets at his local Kmart. If you're looking for these, then Kmart might be a great start on your toy runs! Click through for his report! Even MORE Reports Of 2013 Product Hitting TRU – This Time The Bronx! Wow! The reports are pouring in to us! JTA reader Leanna V. from the Bronx, NY has ALSO found new 2013 product at her local Toys R Us! If you want these, you may want to start trekking out! Keep sending in your reports or be sure to post in our comments! BREAKING NEWS! 2013 "Yoda" Class II Vehicles Found In Canada! MORE BREAKING NEWS! JTA reader Jamie D. from Canada has just sent in proof that more 2013 product has hit! Check out the report! BREAKING NEWS! 2013 "Yoda" Product HAS BEEN FOUND in Toys R Us! BREAKING NEWS! JTA reader rozwell has found the 2013 SW [AOTC/ROTS 3D] Class I vehicle sets at a Danbury Connecticut Toys R Us! Click through for his report! Although it's really an Expanded Universe take on him, there is no denying just how realistic the Darth Vader (Anakin Reveal) Mini Bust is. See this clever interpretation of Darth Vader for yourself in our Research Droids Reviews today! Feel free to leave your own thoughts in our comments section, vote in the poll or even leave comments about it on our Facebook page. Click the banner below for the direct link to the review! As always, you can also send your own personal review requests via email if you'd like to see something that we didn't cover yet. JTA reader Trevor S. writes in with some news for our UK readers! Click through for his report. Republic Attack Shuttle Rearing Its Ugly Head Again? JTA reader Mike_5555 has found the Republic Attack Shuttle at his local Walmart on sale for half price. Could Walmart have a supply of these in their "steel" (yeah, I know the Walmart lingo) and bringing them out for the holiday season? There is a great deal of competition with Toys R Us trying to blow these out as well. It's a shame this vehicle wasn't a bigger hit, because it's a lot of fun. If you don't know much about it, check out our review of it in our RDRs to learn more. Click through for Mike's report. Wave 13 Really Making An Impact At Retail! Red Kithabas Galore! JTA reader Steve U. writes in with additional confirmation of just how hard wave 13 is hitting TRU. And his find includes four (4) cases of the wave including four red bandana Kithabas! Click through for more! Merry Christmas and Happy Holidays from Brian's Toys! As the year winds down, we will be spending extra time with our family and friends. Just a reminder that Brian's Toys will be closed from December 22nd to December 25th, as well as on January 1st, 2013. This week's newsletter features reduced prices and fresh restocks of old favorites. Sideshow Space Slug Diorama (Star Wars), Cobra Commander Diorama (G.I. Joe) and Zartan Sixth Scale figure (G.I. Joe) have all seen price cuts. Several Gentle Giant Mini Busts and Maquettes have been restocked. New this week is the Gentle Giant Jes Gistang Statue as well as several Vintage items from ungraded 12-inch to graded mini-rigs. Visit Brian's Toys for more from this week's newsletter. Yup! There Is Even A Star Wars Connection To The Mayan Apocalypse! Well, most of us are still here, but you just KNEW that there had to be a connection to Star Wars right? Special thanks to JTA moderator Paul B. for the link! Because I hope you didn't hear what I heard: a "little girl" shrieking scream in the middle of the Action Figure aisle at Toys R Us in Philadephia this morning – oh yeah, that came out of my own mouth! Death Star Trench Run Returns? On my toy runs today I found a healthy supply of 2011's SW [SOTDS] Death Star Trench Run. I am curious if you're finding more stock of these in your area too? If you need it, you may get another stab at it! More Mandalorian Assault Transports Arrive! Ha ha! I am off until the New Year (well, almost) and now I have the luxury to check local stores as they open up their doors. BEWARE COMPETITION (you know who you are)! :) But on a serious note, I have found the Mandalorian Assault Transport Special Value Offer set restocked at a few on my local TRU stores. The best part is that these two-packs are now $34.99, for how long is anybody's guess. See for yourself! Salacious Crumb has an annoying cackle, but that's what made us end up falling for him. See him in Mini Bust form with a piece of C-3PO that lights up! It's the feature of our Research Droids Reviews today! Feel free to leave your own thoughts in our comments section, vote in the poll or even leave comments about it on our Facebook page. Click the banner below for the direct link to the review! As always, you can also send your own personal review requests via email if you'd like to see something that we didn't cover yet. .... Deep In The Heart Of Texas! Well, 2012 has certainly been extra hard on our Texan readers this year. All these reports at Five Below, TARGET, FYE, Toys R Us and even Walmart in the East and rest of the country has left them green with envy and feeling very cold in general about the hobby. (You think we had it bad? Ha!) Well, Texas strikes back somewhat and some of the new TVC figures are now showing up. One of our most favorite commenters, flamingtoilet (yes, that's his handle) writes in eagerly with a very exciting find at the Texas exclusive H-E-B stores, oh, and they were on sale too!. Click through for his report! Sponsor Announcement: DASH Is Giving Away Amazon Gift Cards! DASH is giving away Amazon.com gift cards! Don't miss this announcement! Click through for more! MTT For A Song At Amazon.com! As of this posting, the MTT is on sale for $78.62 at Amazon.com! Now that's a deal! Add JTA to Your iPad and iPhone Home Screens! By popular demand, Jedi Temple Archives has added a Home Screen icon for all Apple devices. Now you can launch your favorite Star Wars web site from your iPads, iPhones and iPods with ease! Click through for all the details! Do you want to ogle Mini Bust perfection? Then be sure to ingest the Biker Scout from Gentle Giant's proud Mini Bust line. He's the focus of our attention in our Research Droids Reviews today! Feel free to leave your own thoughts in our comments section, vote in the poll or even leave comments about it on our Facebook page. Click the banner below for the direct link to the review! As always, you can also send your own personal review requests via email if you'd like to see something that we didn't cover yet. At Least Familiarize Yourself With ToyZam! Earlier in the week I saw THIS report on Yakface.com and pretty much overlooked it because I had never heard of the ToyZam chain before. To my shock, JTA reader Bill C. found these two figures (seen below) there in a location that opened within the last week only 2 miles from my house. When I did a store locator search I was shocked to see these stores popping up all over the USA, mostly in malls. Before you scoff, yes, the selection isn't impressive as seen below, but this could easily mean C-3PO could show up amongst many others. In fact Yakface.com is reporting even the 2012 TVC Luke Skywalker (Hoth Outfit) has been found. Click HERE to find a store near you! Let us know of your finds! More Images Of Light-Up Anakin Skywalker! JTA reader Tim V. shares some of his images of thr new Movie Heroes light-up Anakin Skywalker (Episode III) figure. Man, I hope these make their way to the USA. Check these images out. Big Bad Toy Store sends in their latest newsletter. Make sure you make one last check for those Christmas gifts before it's to late! We have always felt that the 30 (77-07) is one of the greatest collections of figures Hasbro has done to date. While not all of them were made in the expected super-articulated fashion that’s become standard today, many of the figures brought into the line are nonetheless done so well from the start that they will likely never see an update again. We will be releasing updates to this very cherished line wave by wave. We have updated our Visual Guides and we’ve processed all-new expanded galleries and a new “stats box” that mimics the card backs of the figures in the line in our Research Droids Reviews. Click through as we spotlight Wave 4. With the exception of Animated Debut: Boba Fett, this wave gave us a whole bunch of all-new figures, including two cantina patrons and another terrific concept figure in Concept Darth Vader! Along with these new figures, we also finally received the long-awaited curved pieces to the cantina bar, allowing us to complete the entire bar in our beloved cantina dioramas! See The Movie Heroes Sandtrooper Loose! JTA reader Mats from Sweden proudly sends us pictures of the yet to be pre-ordered Movie Heroes Sandtrooper (for American collectors) figure in the Star Wars [The Phantom Menace 3D] line look! Check it out. See The Movie Heroes Anakin Skywalker Loose! See The Movie Heroes Boba Fett Loose! JTA reader Mats from Sweden proudly sends us pictures of the yet to be pre-ordered Movie Heroes Boba Fett (for American collectors) figure in the Star Wars [The Phantom Menace 3D] line look! Check it out. Two-Day Sale On TVC Millennium Falcon - Ends Today! We're a day late and a dollar short posting this, but TRU is running a two-day special on the Millennium Falcon ($179.99) for yesterday – we know, what a big help that is – and today only. It is also available online for this price today as well. It's not $125.00, but it's a heck of a lot better than $249.99. We still can't believe that is the normal MSRP for this item. That's a sin. The Gamorrean Guard Mini Bust is close to perfection except for one or two things. See our assessment of it in our Research Droids Reviews today! Feel free to leave your own thoughts in our comments section, vote in the poll or even leave comments about it on our Facebook page. Click the banner below for the direct link to the review! As always, you can also send your own personal review requests via email if you'd like to see something that we didn't cover yet. Here is another wonderful Mini Bust from Gentle Giant Ltd., the Princess Leia In Boushh Disguise collectible. It actually looks like Princess Leia! See this and its "Easter egg" in our Research Droids Reviews right now! Feel free to leave your own thoughts in our comments section, vote in the poll or even leave comments about it on our Facebook page. Click the banner below for the direct link to the review! As always, you can also send your own personal review requests via email if you'd like to see something that we didn't cover yet. Five Below Is Still Receiving Gamorrean Guard Case Assortments! We are still getting reports of Gamorrean Guards and Wedge Antilles figures being found at various Five Below stores across the country. Keep checking your local stores. This hasn't happened in my area yet, but hopefully more are on the way! We are taking a short break from our daily Visual Guide updates as we continue to work behind-the-scenes on our mission to bring more of our existing Visual Guides into our new format. Right now we are working hard on both Sideshow Collectibles and Hasbro's 30 (77-07) line. You will see more and more of those guides appearing in our new format. All guides on our Visual Guides pages featuring the dark gray bordered hover preview are featured in our new format. All new Visual Guides in the new format are also being entered into our Visual Guide Search Engine, a fun way to sort through our many available guides. Do you love the Mon Calamari as much as we do? If so, then check out the Admiral Ackbar Mini Bust from Gentle Giant Ltd. it's one of the most accurately detailed collectibles of this character you'll ever find. He's featured in our Research Droids Reviews today! Feel free to leave your own thoughts in our comments section, vote in the poll or even leave comments about it on our Facebook page. Click the banner below for the direct link to the review! As always, you can also send your own personal review requests via email if you'd like to see something that we didn't cover yet. JTA sponsor DorksideToys writes in with news of their FREE DOMESTIC US SHIPPING offer, whats in stock, available for pre-order, and on clearance at www.dorksidetoys.com. Click through for more. Most Of The Vintage Collection Wave 16 Is Less Than $5 On Amazon.com! Amazon.com has 83⅓% of wave 16 on sale for less than $5.00 (everything except for the Emperor's Royal Guard and the Republic Trooper). Keep in mind that many have been converted to "Add On" status and you won't be able to purchase without a normally priced Amazon item. But we believe there is enough in stock to make this worth your while. Be sure to familiarize yourself with Amazon's rules of "Add On" items. JTA Facebook Contest - THE WINNERS!!! We have picked winners for our JTA Facebook Contest! Click through to see if you were one of the lucky ones! Thanks to all that participated. If you won, I need you to email me at paul@jeditemplearchives.com with your complete name and mailing address and the MISSION # you won. Be sure to email me from the same address that you used to submit your entries. I must hear from you by this Saturday, December 22nd or another winner will be chosen and given your prize. Prizes wil be mailed early January and I will make another post alerting you of this. Thank you! TRU Exclusive TVC Millennium Falcon Back At $125.00 Again! Holy moly! Who knows how long this will last, butThe Vintage Collection Millennium Falcon is back in stock and ToysRUs.com for 50% off at $125.00! Special thanks to JTA reader Frank C. for the head's up! Wolf Pack Ultimate Gift Sets Hits A New Low! Thanks to a tip from our friends at Yakface.com, Walmart.com has the Wolf Pack Ultimate Gift Set on clearance for $14.97, pennies cheaper than Amazon.com blew it out for. Does anyone else see the irony here? Wow. If they just got this into stores for $19.99, it probably would have sold out and the aftermarket would be trying to get $30-40 for them. It's no secret how fond we are of the 41st Elite Corps, especially the Coruscant Clone Trooper that can be see on both Coruscant and Utapau in Episode III. This exclusive Mini Bust came with a unique feature. Do you know what it is? You should! See him in one of our largest Mini Bust galleries in a long time in our Research Droids Reviews today! Feel free to leave your own thoughts in our comments section, vote in the poll or even leave comments about it on our Facebook page. Click the banner below for the direct link to the review! As always, you can also send your own personal review requests via email if you'd like to see something that we didn't cover yet. Customize A Wokling Litter Of Your Own! JTA's very own Sjefke has been busy making Ewok babies for all of the great Ewoks Hasbro has released for us recently. He has graciously provided a tutorial on how you can make a litter of your own woklings for your collection... of various sizes, shapes and colors.... just like their adult counterparts! We'd like to thank him for providing ALL the details to do this including what materials and tools you need and links on where you can purchase them for yourself. Ewok lovers: get ready to customize! The Shadow Stormtrooper is actually a beautiful-looking action figure, but its functionality leaves a lot to be desired. And that's an opinion that was derived in spite of its 14 points of articulation! See him in our Research Droids Reviews right now! Feel free to leave your own thoughts in our comments section, vote in the poll or even leave comments about it on our Facebook page. Click the banner below for the direct link to the review! As always, you can also send your own personal review requests via email if you'd like to see something that we didn't cover yet. Sideshow Collectibles continues to ship their latest sixth scale offerings! Today we add OOM-9 Battle Droid Commander to the Visual Guides. Click below to check out this repaint, featuring the yellow markings of OOM-9 from The Phantom Menace. Brian's Toys features a wide range of new products in this week's newsletter! The new Prime 1st Edition Transformers have hit their shelves and are ready to ship. Star Wars Angry Birds Early Bird Packs are available as well. The Life-Size R2-D2 Clone Wars Edition statue has arrived from Gentle Giant, but act quickly as there are only a few in their inventory. Restocks this week include toy vehicles, Hasbro FX Lightsabers, and Sideshow Premium Format General Grievous and Darth Maul. Finally, check out a new Luke Skywalker double telescoping figure and an AFA-Graded Snowspeeder (Blue Box) over at Brian's Toys! Do yourself a favor and check out Sideshow Collectibles' Aayla Secura Premium Format Figure. Goodness, gracious. It may just be one of the top five best pieces Sideshow Collectibles has ever done. See it all in incredible detail in our Research Droids Reviews right now! Feel free to leave your own thoughts in our comments section, vote in the poll or even leave comments about it on our Facebook page. Click the banner below for the direct link to the review! As always, you can also send your own personal review requests via email if you'd like to see something that we didn't cover yet. Congratulations to our good friend Darth Eddie for being featured in Yakface.com's Collection Spotlight. Be sure to check out just a portion of his collection! More $3 And Change The Vintage Collection Figures! JTA reader Jesse A. alerts us to the fact that the four Discover The Force carry-forward figures in The Vintage Collection are now at a record low $3.49 each on Amazon.com. They've also been converted to "Add On" items. This means they are one per cart, but you'll be able to get them with any regular purchase (there are PLENTY of other cheap TVC in stock at the moment). FREE shipping is also included for any orders $25 and higher! For those of you unaware, these are currently $9.96 each STILL at Walmart in packaging not nearly as nice. Tonight we continue our look at the latest Sideshow Collectibles offering: 212th Attack Battalion: Utapau (2nd Airborne Company). We took a look earlier today at this figure in our in-depth Research Droids Review, and now we add the awesome Airborne Trooper to our ever-growing Visual Guide collection! Click below for the full guide! Our friends at Yakface.com are reporting that the Darth Maul Returns TARGET exclusive Battle Packs set has hit clearance in the Tulsa, Oklahoma area. You may want to make a mental note of this for your area. Click through to check out the full details! Many Millennium Falcons Coming In For A Landing! JTA reader Steve U. from Horsham PA writes in to let us know his Toys R Us are getting in Millennium Falcons left and right. Let's hope they get discounted again for a much more reasonable price. This item is easily worth $149.99 in TVC packaging. But if it goes lower than that then it's gravy! Sideshow Collectibles is intent of giving collectors every last clone from Attack Of The Clones and Revenge Of The Sith. 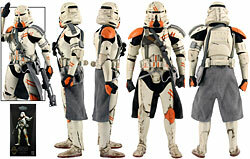 The 212th Attack Battalion: Utapau (2nd Airborne Company) figure brings us one step closer. We look at this latest clone in depth in our Research Droids Reviews today. By the way, this is our 1300th review! Feel free to leave your own thoughts in our comments section, vote in the poll or even leave comments about it on our Facebook page. Click the banner below for the direct link to the review! As always, you can also send your own personal review requests via email if you'd like to see something that we didn't cover yet. JTA field rep Dan Curto alerts us to an amazing deal! $3 and change Star Wars figures! Granted, these are old figures, but how can you pass up a Darth Vader for $3?! SlickDeals.com/GoHastings.com has these crazy bargains! We have always felt that the 30 (77-07) is one of the greatest collections of figures Hasbro has done to date. While not all of them were made in the expected super-articulated fashion that’s become standard today, many of the figures brought into the line are nonetheless done so well from the start that they will likely never see an update again. We will be releasing updates to this very cherished line wave by wave. We have updated our Visual Guides and we’ve processed all-new expanded galleries and a new “stats box” that mimics the card backs of the figures in the line in our Research Droids Reviews. Click through as we continue our look back today as we feature Wave 3, which featured some very nice all-new additions to the line, including the long-awaited for Biggs Darklighter (the only character from a deleted scene in the entire line) and the very impressive (and big) Concept Chewbacca! Today we present to you at 12:12 AM on 12/12/12 a 12-inch 12-back, the Luke Skywalker Jumbo Vintage Kenner Figure. (Hey, it's the last time we can take advantage of this numeration during our lifetime.) Do you collect this line? Check him out in our Research Droids Reviews on this landmark day. Feel free to leave your own thoughts in our comments section, vote in the poll or even leave comments about it on our Facebook page. Click the banner below for the direct link to the review! As always, you can also send your own personal review requests via email if you'd like to see something that we didn't cover yet. New Five Below Find That Might Interest You! JTA reader Frank C. sends us a report on a small but important The Clone Wars related find at Five Below. You already know about the action figures, now see what else they have for a steal! Click through to see Frank's report! Buy 2 Get 1 Free On Select Star Wars Items At Kmart.com! JTA reader James M. alerts us to the latest holiday deal at Kmart.com. Buy two Star Wars items and get the third FREE. Click through to see if you can utilize this deal! 2013: A Possible Year For The Reinvention Of The Vintage Collection? BREAKING NEWS: Figures In The Vintage Collection To See Rerelease! BREAKING NEWS: Hasbro sends us news about The Vintage Collection! Fan favorites and hard to secure figures in the line will be seeing rerelease! Two updates follow. The first is a list of figures for the USA and the second is a list for international collectors. Click through or more information! The Ultimate Gift Set (104th Battalion "Wolf Pack" Clone Troopers) is only "ultimate" from a certain point of view. See all the tangents we go off on in our Research Droids Reviews today. Feel free to leave your own thoughts in our comments section, vote in the poll or even leave comments about it on our Facebook page. Click the banner below for the direct link to the review! As always, you can also send your own personal review requests via email if you'd like to see something that we didn't cover yet. The Ultimate Action Figure Collection gets a plug in Star Wars Insider magazine this month! They are also giving away three copies of it! Be sure to grab your issue of the Star Wars Insider! Special thanks to JTA moderator Paul B. for the news and image. Over 13,000 people petition the White House to build a Death Star. Fox News has the story! Those of you that follow JTA on Facebook already know how obsessed we are about AMC's The Walking Dead. Well good friend Morgan posted this on my own personal Facebook wall. I had to share. Could it get any better than this?! Walmart: The New eBay And/Or Amazon?! JTA reader Corey alerts us to this rather hysterical Star Wars item at Walmart.com. Is this a mislabeled Black Friday Set. Is Walmart trying to copy eBay and/or Amazon.com? Check out the silliness! The Vintage Collection Wave 13 In Stock At TRU.com! The Vintage Collection wave 13 is in stock at TRU.com! With red bandana Kithabas hitting local brick and mortar TRU stores, we'd imagine there's a good chance that this is what online received too! Mace Windu In Episode VII? This should start up some controversy again on whether Mace is dead, alive or a ghost, but Samuel Jackson says H - E - double hockeys sticks - YEAH! to appearing in Episode VII as Mace Windu! Check out the article! E-online has the story!! 2012 Jedi Temple Archives Facebook Contest: THE ANSWERS! Thank you to all that particpated in our 2012 JTA Facebook Contest. We had a blast and we hope you did also. It will take some time to compile the results, we will most likely need until the weekend to do this, but take some time to see how well you did. Our goal was to introduce you to other aspects of our site other than the front page or even the Reviews and Visual Guides. Hopefully you saw a few more things to interest you! You know what they say: "If you give them action figures, they will come!" Thank you for the huge turnout. We will deifnitely do this again! Click through for the answers! The Emperor Palpatine Mini Bust based on his Episode III appearance is the best likeness of the character you will find. Honestly! See it for yourself in our Research Droids Reviews right now. Feel free to leave your own thoughts in our comments section, vote in the poll or even leave comments about it on our Facebook page. Click the banner below for the direct link to the review! As always, you can also send your own personal review requests via email if you'd like to see something that we didn't cover yet. TRU.com Is Over The 50% Sale Price Already! The Toys R Us exclusive The Vintage Collection Millennium Falcon which was ON SALE for $125.00 + FREE shipping for less than 24 hours is now back at a glorious $249.99 and only ships FREE if you use a TRU credit card (that's sarcasm folks). It was nice while it lasted. Hopefully you secured yours! To give you some additional perspective, shipping to my state was over $45. JTA Facebook Contest: It's Almost A Wrap! Our JTA Facebook Contest wraps up in about 4 hours at 11:59 PM EST tonight! Click below to access directions for MISSION #15 as well as links to the previous 14 MISSIONs! Thanks to all of you that participated. My email has been INSANE this weekend! But it's been a blast! K & C Collectibles is offering FREE Shipping starting December 8th, 2012 through December 15th, 2012 to all customers who order $50+ and your shipping address is within the continental USA. Offer not valid on pre-order items. Click through for all of the their latest news! News of our FREE DOMESTIC US SHIPPING offer, whats in stock, available for pre-order, and on clearance at www.dorksidetoys.com! Click through for all of the their latest news! Boy, I can't get a moment's rest today! Thanks to all of you emailed and posted on our Facebook wall that the MTT is also on sale for 50% off too for $90.00 at TRU.com! Walmart Black Friday 8-Pack In Stock Online! The Black Friday Saga Legends 8-pack is also in stock at Walmart.com! Too bad they don't have the Movie Heroes of The Clone Wars packs!? TRU Exclusive TVC Millennium Falcon $125 + FREE Shipping! The Toys R Us exclusive The Vintage Collection Millennium Falcon is ON SALE for $125.00 + FREE shipping (a cost of nearly $45) Gee - do you think they finally realized how overpriced this was?! Why are you still here? Special thanks to JTA reader Corey V. for tipping us off! Quite A Few TVC Wave 16 Figures Are Less Than $7 Each At Amazon! There are many The Vintage Collection wave 16 figures on sale at Amazon.com for less than $7! Take for instance this Ob-Wan Kenobi which at the moment is selling for $6.49. As always, this could change in a moment's notice, so don't delay! Search for other deals too! Thanks to all who wrote in with this tip including Jesse A., Jeffrey T. and Mike V.
2012 Jedi Temple Archives Facebook Contest - The Final MISSION #15! Welcome to the 2012 Jedi Temple Archives Facebook Contest! Here is our final MISSION #15! This also marks the news of the deadline for this MISSION and all the ones before it. All submissions must be received by 11:59 PM EST tonight. So you have the rest of the day to complete all of them! Please click through to see what you need to do to complete it and be sure to read ALL DIRECTIONS very carefully. You must do exactly what is asked in order to successfully complete your MISSION! This is one of the larger prizes! Welcome to the 2012 Jedi Temple Archives Facebook Contest! Here is MISSION #14! We have one more to go! Please click through to see what you need to do to complete it and be sure to read ALL DIRECTIONS very carefully. You must do exactly what is asked in order to successfully complete your MISSION! This is one of the larger prizes! Welcome to the 2012 Jedi Temple Archives Facebook Contest! Here is MISSION #13! Please click through to see what you need to do to complete it and be sure to read ALL DIRECTIONS very carefully. You must do exactly what is asked in order to successfully complete your MISSION! This prize has been donated by JTA sponsor DorksideToys! Welcome to the 2012 Jedi Temple Archives Facebook Contest! Here is MISSION #12! Please click through to see what you need to do to complete it and be sure to read ALL DIRECTIONS very carefully. You must do exactly what is asked in order to successfully complete your MISSION! This prize has been donated by JTA sponsor DorksideToys! Welcome to the 2012 Jedi Temple Archives Facebook Contest! Here is MISSION #11! Please click through to see what you need to do to complete it and be sure to read ALL DIRECTIONS very carefully. You must do exactly what is asked in order to successfully complete your MISSION! This prize has been donated by JTA sponsor DorksideToys! Here is another pretty decent Deluxe figure from the Revenge Of The Sith line. But did you know there's a relatively unknown variation of it? it's true. Check out the Stass Allie Deluxe figure, the one responsible for bringing us this style of BARC speeder. It's all in our Research Droids Reviews right now. Feel free to leave your own thoughts in our comments section, vote in the poll or even leave comments about it on our Facebook page. Click the banner below for the direct link to the review! As always, you can also send your own personal review requests via email if you'd like to see something that we didn't cover yet. THIS ISN'T OUR LAST MISSION! WE HAVE FIVE (5) MORE COMING! Thank you for your interest in the 2012 Jedi Temple Archives Facebook Contest! Here is MISSION #10! Please click through to see what you need to do to complete it and be sure to read ALL DIRECTIONS very carefully. You must do exactly what is asked in order to successfully complete your MISSION! Our own mascot is the prize for this contest! Welcome to the 2012 Jedi Temple Archives Facebook Contest! Here is MISSION #9! Please click through to see what you need to do to complete it and be sure to read ALL DIRECTIONS very carefully. You must do exactly what is asked in order to successfully complete your MISSION! This MISSION will require you to travel. Welcome to the 2012 Jedi Temple Archives Facebook Contest! Here is MISSION #8! Please click through to see what you need to do to complete it and be sure to read ALL DIRECTIONS very carefully. You must do exactly what is asked in order to successfully complete your MISSION! Do you smell BACON? We do! BREAKING NEWS: TVC Wave 16 Found At USA Brick And Mortar Retail!!! We have an amazing report to share with you! The final wave of The Vintage Collection has officially been found on US soil in brick and mortar! Mall store FYE has received wave 16. Yes, you can now purchase Emperor's Royal Guard, Republic Trooper, Nien Nunb and all the rest at a regular retail store. They retail for $10.99 each! Special thanks to JTA reader Nicholas S. for the news! Click through for his incredible report! Welcome to the 2012 Jedi Temple Archives Facebook Contest! Here is MISSION #7! Please click through to see what you need to do to complete it and be sure to read ALL DIRECTIONS very carefully. You must do exactly what is asked in order to successfully complete your MISSION! Lucky #7 will offer you the hard to secure Republic Attack Dropship! Welcome to the 2012 Jedi Temple Archives Facebook Contest! Here is MISSION #6! Please click through to see what you need to do to complete it and be sure to read ALL DIRECTIONS very carefully. You must do exactly what is asked in order to successfully complete your MISSION! Find out who is the Master! Welcome to the 2012 Jedi Temple Archives Facebook Contest! Here is MISSION #5! Please click through to see what you need to do to complete it and be sure to read ALL DIRECTIONS very carefully. You must do exactly what is asked in order to successfully complete your MISSION! The task may be shocking, but it will score you a Sandtrooper. Emperor's Royal Guard For $14.99 At Amazon. This Will Change Soon! This could change at any second, but the Emperor's Royal Guard is in stock at Amazon.com by one seller for $14.99! After an uncontrollable software failure, our friends at JediDefender.com are back with a revised look to the site and new ownership! Click through to check out all that is new over there. It's great to see them in good health again! We look forward to what's coming in the future! Welcome to the 2012 Jedi Temple Archives Facebook Contest! Here is MISSION #4! Please click through to see what you need to do to complete it and be sure to read ALL DIRECTIONS very carefully. You must do exactly what is asked in order to successfully complete your MISSION! Hello, Numa! Finding her will secure you two 212th Attack Battalion members, not Waxer and Boil, but two others for your collection! Yak Face makes a couple appearances on this week’s Brian’s Toys Newsletter. Along with a vintage Yak Face figure on Tri-Logo card, he also is available as a Gentle Giant mini bust from their 2009 gift to premier guild club members. Looking for more vintage? Several rare prototype coins have arrived from a Bronze Lando and Imperial Dignitary to 1996 blank back coins. Fresh on the plate from Sideshow and Gentle Giant are a Sixth Scale Utapau Airborne Trooper and Pre Vizsla animated maquette. Angry Birds fans can also pick up the latest Strikes Back Packs and Koosh Jedi Slingshot. For more from this week’s newsletter, go to this week's newsletter! Are you impressed with this fully dressed version of Darth Vader as much as we are? You probably shouldn't discount this Deluxe version of "dress up" Anakin Skywalker, because the completed version of the black iron lung is really rather impressive. Check it out in our Research Droids Reviews today! Feel free to leave your own thoughts in our comments section, vote in the poll or even leave comments about it on our Facebook page. Click the banner below for the direct link to the review! As always, you can also send your own personal review requests via email if you'd like to see something that we didn't cover yet. Welcome to the 2012 Jedi Temple Archives Facebook Contest! Here is MISSION #3! Please click through to see what you need to do to complete it and be sure to read ALL DIRECTIONS very carefully. You must do exactly what is asked in order to successfully complete your MISSION! Don't get mauled by the pressure. Take your time and enjoy this contest! Welcome to the 2012 Jedi Temple Archives Facebook Contest! Here is MISSION #2! Please click through to see what you need to do to complete it and be sure to read ALL DIRECTIONS very carefully. You must do exactly what is asked in order to successfully complete your MISSION! This Sith Lord will make you malevolently gush! Welcome to the 2012 Jedi Temple Archives Facebook Contest! Here is MISSION #1! Please click through to see what you need to do to complete it and be sure to read ALL DIRECTIONS very carefully. You must do exactly what is asked in order to successfully complete your MISSION! You'll definitely want to secure this obscure clone commander because he is sly as a fox to locate! The 2012 JTA Facebook Contest Is Beginning In Moments! Out 2012 JTA Facebook Contest is about to start! Remember: one of our MISSIONs can pop up at any time during this weekend and there will be over a dozen of them. You need to stalk our page frequently so you don't miss any. Also make sure you're familiar with our rules! Don't disqualify yourself by not being in the know! Tonight's Visual Guide update features a Sideshow Collectibles multipack—instant army builders for Team Commander Cody! Click below to check out our massive guide for Boil and Waxer with Numa, and see if this set is worth the price tag by reading up on it in our Research Droids Review! JTA Facebook Contest: The Fine Print! Be In The Know Please! Please READ THIS FIRST if you plan on participating in 2012's JTA Facebook Contest which starts at 12:00 AM midnight tonight (on or about). This Is Your Final Reminder! OK, this is your last chance to act! Our JTA Facebook Contest starts tomorrow! Like us on Facebook before 11:59 PM EST today or miss out on the fun this year. More details about the contest will posted tonight and be sure to watch out for the first MISSION right after 11:59 PM tonight (midnight) EST. Thanks to all of our new Facebook friends for joining the fray! We hope you enjoy the weekend well with us! Click through to see all the prizes this year if you don't know by now! Here is a pretty fine version of General Grievous. Surprisingly he is from the Deluxe line. He comes with an action feature and his coloring is off by a great deal, but we just can't seem to find reasons to dislike him. Will you find favor with him too in our Research Droids Reviews today? Feel free to leave your own thoughts in our comments section, vote in the poll or even leave comments about it on our Facebook page. Click the banner below for the direct link to the review! As always, you can also send your own personal review requests via email if you'd like to see something that we didn't cover yet. The MTT Hits Hard But What's Up With That MSRP? JTA reader Andrew L. writes in to let us know that the MTTs are arriving in his NJ TRU hot and heavily. The bad part? Well, you're just going to have to click through and see the price tag because it's obscene. TRU: this vehicle WILL NOT move at this price. Sideshow Collectibles has brought us more Sandtroopers than we can shake a gaffi stick at! But, with the addition of the Dewback they are all welcome, and all sport different paint applications to create a very unique squad to accompany the Dewback. Check out the most recent addition to the team: Sandtrooper (Desert Sands Detachment). Click below to check out this Visual Guide, and read our in-depth review, with additional photo galleries and detailed commentary, right here! Hurry! Republic Attack Dropship Is BACK IN STOCK At TARGET! The Republic Attack Dropship is back IN STOCK and at the moment on sale for $14.44 at TARGET.com as of this posting. Don't expect it to last! Special thanks to JTA reader Robert W. for the head's up this time!! Movie Heroes wasn't the first line to include light-up figures you know. Even after the Power F/X line, Hasbro threw in some obligatory light-up figures like Emperor Palpatine from the Revenge Of The Sith Deluxe line. We need a definitive update of this version badly, but check out this screen-inaccurate use of this particular outfit of the character by Hasbro in our Research Droids Reviews! Feel free to leave your own thoughts in our comments section, vote in the poll or even leave comments about it on our Facebook page. Click the banner below for the direct link to the review! As always, you can also send your own personal review requests via email if you'd like to see something that we didn't cover yet. ToyzMag.com Runs Contest For French Edition Of Sansweet Book! Our friends at ToyzMag.com are running a contest for a free copy of the French edition of The Ultimate Action Figure Collection. One lucky winner will receive a book plate signed by all four authors. Our French-speaking audience should take advantage of this great opportunity! Loose translation of this post can be found by clicking through! 104th Wolf Pack Battalion On Sale At Amazon.com For $15 And Change! Amazon.com changes their prices more often than most people change their underwear, but as of the time of this post, the 104th Wolfpack Battalion is more than 50% off, eclipsing its Black Friday's "Lightning Deal" significantly for a mere $15 and change. This set averages between $30 and $40 online. (It pays to wait!) Also, figures, like 2012's TVC Ahsoka are hanging around $10 now too! Don't delay! Special thanks to JTA reader Jacob Stewart for the head's up on this! Amazon Has Select Wave 16 Figures For $7 And Less! Obi-Wan Kenobi and Orrimaarko are $7 and change on Amazon.com as of this posting. Even cheaper are the four carry-forward figures from the Discover The Force line. Click any of our Amazon shopping links under Shopping and search for these great bargains! Special thanks to JTA reader Jesse A. for the head's up on these! Every action figure collector knows what it’s like to wake up on that special day, find that giant box, and open that toy you’ve been dreaming about all year. DASH also knows how wonderful that feeling is, and that’s why we’re trying to give five lucky collectors the Christmas of their dreams and their childhood. Check out the details for our Christmas Club Contest and register on Collector-ActionFigures.com to make sure you’re entered to win one of our special Christmas gifts which will arrive wrapped and all. Ewan McGregor said he would be Obi-Wan Kenobi if they needed him to be! DigitalSpy.com has the interview! Sideshow Collectibles has taken it to the next level with their first sixth scale vehicle release in the S.T.A.P and Battle Droid set! Perhaps this means we will see some other small-scale vehicles in the future (like the landspeeder or speeder bike, perhaps?). In the mean time, you can check out this delightfully detailed (and surprisingly articulated) set featuring the Single Trooper Aerial Platform vehicle! The folks over at Lynx Collection have unveiled their next poster set, this time featuring artwork from the Prequel Trilogy. Click though to check these out and pick up a set from this limited collection! The Ultimate Action Figure Collection Tops The Charts! Steve Sansweet emailed me eagerly reporting that The Ultimate Action Figure Collection has landed on eBay's front page! Also, only on sale officially for a short time, it has already hit #1 in Best Sellers/Antique & Collectible Toys, #1 in Antique & Collectible Toys/Hot New Releases and #1 in Antique & Collectible Toys/Most Wished For! Congratulations Steve! Here is a great set that is better as a whole than the individual parts that make up the set. The Bantha With Tusken Raiders [Version 2] Battle Packs set is surprisingly a variation that some collectors don't know exist either. That surprises us! Check it out in our Research Droids Reviews! Feel free to leave your own thoughts in our comments section, vote in the poll or even leave comments about it on our Facebook page. Click the banner below for the direct link to the review! As always, you can also send your own personal review requests via email if you'd like to see something that we didn't cover yet. Our next Sideshow Collectibles Visual Guide features Commander Neyo (91st Reconnaissance Corps), the last commander to be released by Sideshow from the Revenge of the Sith "Fab Five"! With his completion we now have all five commanders featured from ROTS, and they look awesome all together! Make sure to visit this Visual Guide to see some great images of the group and much more. When you are finished please stop by and read our full review right here! More Prizes Added To The JTA Facebook Contest This Saturday! Jedi Temple Archives is extremely excited to announce brand new prizes from our sponsors DorksideToys and Brian's Toys in addition to a donation from me, a signed copy of The Ultimate Action Figure Collection! Click through for the latest prize announcements! Remember, the fun begins on this Saturday, December 8th, so PLEASE make sure you become one of our Facebook fans/followers before then! You must "like" us on Facebook to be eligible to participate in this contest. What are you waiting for? Like, like, like us right now! See what you could win! The images below are just some of the prizes! Did anyone see Extreme Makeover Home Edition last night? There was quite a bit of Star Wars stuff happening in the episode. Deadline.com has a recap and offers some of their thoughts about it. ToyzMag.com Reviews The Ultimate Action Figure Collection (With Photos)! George Lucas explains he has very little to do in his role of consultant for the new Star Wars films. Access Hollywood has the full story! JTA moderator Sjefke writes in to let us know that Marshalls is getting in heavy supplies of 2010-2011 TCW "Shadow Of The Dark Side" Class I vehicles. If you missed these (which is hard to believe at this point), it may be worth your while to check this store out. Besides, you never know if that Y-wing Bomber might just start showing up somewhere! JTA moderator Bombadgungan writes in with a report on a new sale price for the MTT at Fred Meyer. Click through to read his report. One of the most indecisive Mini Bust of all time, Jar Jar Binks WILL indeed be coming with a real functioning light strand. Gentle Giant Ltd. nearly pulled the plug on this feature only a couple of weeks ago, but due to fan demand, the real "light-up" lights are indeed coming! Maybe I am just cranky because I still don't have my copy of The Ultimate Action Figure Collection, but the Holographic Pre Vizsla Maquette really ticked me off. What a piece of junk! Witness our contention in our Research Droids Reviews! Feel free to leave your own thoughts in our comments section, vote in the poll or even leave comments about it on our Facebook page. Click the banner below for the direct link to the review! As always, you can also send your own personal review requests via email if you'd like to see something that we didn't cover yet. Tonight's Visual Guide update takes a look at a recent Sideshow Collectibles offering: the 1:6 scale Tusken Raider (Sand People). Click below to check out our guide featuring another amazing OT offering from Sideshow Collectibles, and check out our Research Droids Review to see why we gave this figure five stars! We complete the 2005 Revenge Of The Sith basic figure lineup with Yoda, a figure that has a frustratingly great facial likeness but relegated to a terrible action feature ridden body, today in our Research Droids Reviews! Feel free to leave your own thoughts in our comments section, vote in the poll or even leave comments about it on our Facebook page. Click the banner below for the direct link to the review! As always, you can also send your own personal review requests via email if you'd like to see something that we didn't cover yet. Wow! Get Some Great Loose Figures From Multipacks And Exclusives! You all know about the Emperor's Royal Guard from eBay seller viperskingdom, but we recently spent some time seeing what else he has to offer and were amazed by his selection and great prices on so many sought after loose figures. Pictured below are just some of them. Click any image below to be taken to the Star Wars items in his store! As always, read each auction carefully and remember he offers free shipping on so many items! Consistent Reports Of Wave 13 At TRU And Walmart....Still! Faithful and long time JTA reader darth_apathy happily sends us the report that wave 13 continues to make a splash at Walmart and sends us a snapshot of his long-awaited Wedge Antilles figure. The great news here is that it beocming more and more likely that all of us wil have a chance to score our red bandana Kithaba or pink scare Dr. Evazan. These are good times for us! With all the TVC stuff showing up everywhere, people are coming out of the woodwork looking for these deals that normally do not. It only took six Five Below stops this weekend, but I finally found a Gamorrean Guard and some great other "filler" figures at Five Below in Newtown, PA. Every store before this one told me I just missed the last Gamorrean Guard and I was also told that they are getting tons of phone calls looking for this figure. (That's the last time I post news before I find my stash! - Just kidding!) I guess good news travels fast! FYI - this is the last week Star Wars figures are appearing in their ads. It will be interesting to see if stores get anymore Star Wars figures in with this magnitude going forward! Check out my find! More Canadian Wave 16 Reports! The reports from Canada keep coming in! You saw the report here first at JTA, now JTA reader Jamie writes in with more unbelievable finds and things that just punch the gut of American collectors! He lives in Ottawa, Ontario and these figures were found at the Walmart at Maitland & Baseline. Click through for Jamie's unbelievable report! Darth Maul Returns + Many Other Star Wars Items On Sale At TARGET! For those of you that still need it, the Darth Maul Returns Battle Packs set is on sale for $16.99 until December 8th. There are also many other Star Wars items on sale this week including basic figures for $1.50 off (Movie Heroes and The Clone Wars only). To withstand Hoth's brutal climate, Rebel troopers wear polarized snow goggles, insulated jackets, heavy boots and white helmets. They also make adjustments to their weapons to ensure their blasters and cannons function in the subzero conditions. Click below to check out our last The Legacy Collection update (at least for a few days), and see if this one is a figure not to miss in your collection by reading our Research Droids Review (spoiler: we give him five stars). JTA sponsor DorksideToys.com writes in with their latest news and the announcements of some awesome new arrivals. Here are just some of the things that have just arrived and in stock! Click through for their complete report. Get the last wave of the Star Wars Vintage Collection now! MORE Loose Emperor's Royal Guards Back In Stock At eBay! It sold out in nanoseconds yesterday, but eBay seller viperskingdom has just gotten in more stock of these ERGs! The best part is that these figures ship FREE from outside the USA! Amazing! HERE is the link to the new auction! Don't delay, these are flying out of cyberspace! Millennium Falcon Sale Starts Now! As we told you last week, The Vintage Collection Millennium Falcon is one sale at TRU.com for $189.99. The ad says $179.99 (for brick and mortar), so that may still be your best bet. We just weren't too crazy about the 501st Stormtrooper, how about you? We love the non-profit 501s Legion organization and all the great things they do, but this action figure was a little over the top. Check this figure out in our Research Droids Reviews database right now! Feel free to leave your own thoughts in our comments section, vote in the poll or even leave comments about it on our Facebook page. Click the banner below for the direct link to the review! As always, you can also send your own personal review requests via email if you'd like to see something that we didn't cover yet. GalacticHunter.com Reviews The Ultimate Action Figure Collection! Our very good friend Mike Sullenger at GalacticHunter.com has written an excellent review on The Ultimate Action Figure Collection book. Please take a few moments and read his thoughts on it!! Luke Skywalker dons a robe for us in tonight's Visual Guide update, featuring Luke as he appeared at the end of The Empire Strikes Back! Click below to check out our latest update from The Legacy Collection! Kithaba (Skiff Guard) Red Bandana Variation Continues To Hit Retail! JTA reader Gary H. clearly wants me to put a hit out on him as he proudly shows off his latest TRU find! (Congrats Gary – that is just my envy talking.) Click through to see his incredible report and subsequent purchase! 3D Episode II And Episode III Release Dates Announced! StarWars.com has announced the official release dates for Episode II and Episode III in 3D. Click through for more! Special thanks to JTA reader Michael T. for the head's up! ....But complete from a certain point of view! Please READ this carefully before clicking through, but eBay seller viperskingdom has a healthy supply of LOOSE and INCOMPLETE 2012 TVC Emperor's Royal Guard figures in stock. The great news for OT fans is that only the EU accessories are missing. OT fans can have complete loose ERGs for $11.99 each, especially since they're going for over $20 on eBay! Hurry, these will disappear faster than any Hasbro restock we've advertised! This eBay seller also have some other great loose TVC figures in stock so take a look! Special thanks to JTA reader Rob C. for the head's up!